September 3rd, 2014 Tyabb Airshow in Australia.... supposedly an experienced pilot....... A go-around would have cost him nothing but a little ribbing from his friends. 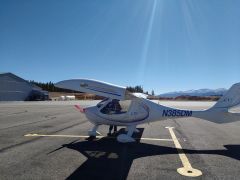 Landed at Leadville, CO last fall. Density Altitude was 12'000 when I took-off to return back to homebase. That plateau is doable, buy I don't know why anyone would want to. I've been asked for a race! I need advice! That's a really sweet looking aircraft. This is a fun topic......... looking forward to seeing the results. Engine failure today and forced landing. Buckaroo: I fly a 2003/4 manufacture CT2k, and I had the same condition. Once, I was waiting for clearance to fly into the Washington DC SFRA, so I put my plane into a right-hand orbit for 10 minutes or so. What happened is, that my left tank was empty and my right tank had all of it's fuel shifted outboard... thus I unported the fuel lines and ran my engine out of fuel at the end of the 10 minutes. I immediately went into engine-out procedures, and looked for a field to put it down in while simultaneously going to an emergency squawk and trying to restart my engine. I got two restarts that died after about 20 seconds, but I did get some altitude out of the restarts. I got a 3rd restart about 50 feet about my emergency landing field ( which was a field with standing water between the rows of something..... it would have been a bad outcome. ), and that one held. So I fly to the nearest airport about 10-12 miles away, and land. Turns out I had 7 gallons of fuel in the tanks..... but by flying somewhat uncoordinated, slopped all of my fuel into one wing-tank, and then tilted it away for the fuel line. I probably had less than 30 hours in the plane total at that time. I was fairly new to flying, and very new to my aircraft. The design of the plane, and my unfamiliarity with the fuel system put me into a hazardous condition. Since that day, I have flown my plane coast to coast, and north to south around this country. I flew to the highest airport in the nation last fall. I fly all over, but I have two specific fuel related rules I follow religiously. 1. I dip my tanks every day I fly. I know specifically how much fuel I have in the tanks before I fly......... always. I don't rely on the sight tubes at all. I look at them now and then, but I never actually use them for flight calculations. 2. I ALWAYS refuel upon landing, when 1/2 or more of my of my fuel has been consumed. When I get below 15-16 gallons, I watch what I'm doing carefully. I am not going to run myself out of fuel again. If I am going on a 2 hour flight, I'm gonna have 20 gallons of fuel onboard at take off. If I'm going on a 3 hour flight, I will have 25-30 gallons of fuel on board at take off. One time I flew from Hot Springs Arkansas, to Asheville, NC, non-stop ........ 5 + hours. You can be sure I watched my fuel like a hawk towards the end, and watched the coordinated condition of my aircraft near the end of the flight. I landed with more than five gallons, but under 10............ probably around 8-9....... but I was very aware of the possibilities. So, now you know. Don't trust sight tubes..... use them as reference to determine if there is fuel in the wings, but not how much. Dip the tanks, and KNOW how much fuel you have before you take-off. I plan using 5.2 gallons/hr in-flight on trips. I try to land with two hours remaining. I know I am overly cautious........... and I'm fine with that. I was taught never to trust a fuel gauge... it will lie to you at the worst possible time. Sight tubes do same...... for different reasons. Levil's new stuff.... ADS-B and more. Neat design. The pilots better use it only 1/2 the time. Sure as s#it when their plane is shot to pieces and they need to get aboard, the Magic Carpet won't work. Lead does that to a aircraft system. Best Landing set up for a newbie . . .
Never force it down, you'll just get a bounce........ let it land itself, use a little power on it like you are, and flare when it's time. The published FD figures you quoted are pretty good............. Engine will not cool to much....... it's WATER cooled at the heads and that helps it maintain even temps. Lastly, I've never had my plane hesitate when power is applied...... it's basically instantly responsive. That doesn't mean it can't fail........ it just never has.... and I have full confidence in the Rotax....... 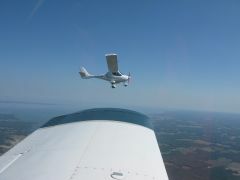 Wish you had an experience CTSW/LSA flying buddy/Instructor. Finally.......... the hardest thing you'll probably have to get your head around, is the use of the parachute. Most of us were trained to go directly into the engine-out mode of operation; establish glide, fly the airplane, look for a place to put it down, etc. You've never had the option of using a chute. Cirrus now has a program established to re-train pilots to use the available chutes when it all goes wrong. 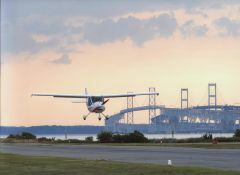 Cirrus figured that more than a hundred pilots lost their lives, in survivable incidents, because they never bothered to use the chutes that were available to save their lives. They always kept trying to fly and save the plane... right into the deck, with fatal results. You are going to have to re-train your brain into accepting another option.... the chute. (I had an emergency once, and I worked myself through it when in retrospect I probably should have used the chute..... but with my prior training kicking in, it never crossed my mind.....I was too busy trying to survive) I've had to consciously re-train my thought patterns. I've still never used it, and I never expect to, but at least now, I'll always consider if it isn't the best option.) I have my own personal minimums......... engine out over rocky/mountain terrain, or trees.... try and get to an open area and use the chute. Engine out below 800 ft AGL, use the chute. I will not try the impossible turn back to the airport if I'm not above 800' at a minimum. If I have full control and a flat open area ahead of the aircraft, I may well attempt to land forward...... but the chute is a option I might avail myself of. I have to remind myself now and then, that I always have another option. Besides, I can always get another airplane; that's what insurance is for. Montana weather is improving and got my second flight today! I had my chute repacked and rocket replaced last spring. I don't recall exactly, but about $1800 seems right. You have to pay for ground shipping. And of course, someone to do the pull and reinstall. Newbee with landing flap questions. The plane is perhaps best described as "nimble". Short field full 40 degree flaps, but if you get too slow, it will drop. Normal landings is 30 or 15 degrees. My CT2k like 30 degrees best, but my wings are 3 feet longer than the CTSW and subsequent CTs. DO NOT push it down on the runway..... simply fly in along the centerline and let it sink. A little power in short final/landing phase will ease the sink. In a very strong crosswind (15 or + kts) 0 flaps, and increase the landing speed to 60/62 kts. The plane is very forgiving for forgetful people......... the Rotax supplies almost immediate power when called upon, and it will pull you out of trouble if you let it. In a landing configuration, an application of full power will almost, almost, immediately arrest your sink rate...... at least that's been my experience. I've even taken off with -12 degree flaps......... but I wouldn't want to do it at max gross (1320) again. RUNTOEAT/FLYINGMONKEY: Weather here is not particularly predictable. We had a huge high pressure over Colorado for a couple of days prior to the trip. Skys very clear with visibility a hundred miles or more at altitude. Wind in Wilkerson Pass the previous day was 23 with gusts to 29. Wind during my time of landing was 320 at 12 G17, but the good news was RWY heading was 340. Frankly, the wind was very beneficial on landing and take-off. Almost all of South Park is pretty high; Fairplay Co is at 9,900 and Buena Vista is at 9,000. I like 2,000 AGL so on the trip I was at 11,000 to +12,000 most of the time. Oxygen measurement off my finger tip measured 97-93 saturation depending. I live at 5,000 and I'm older, but used to the altitude. I think I have more red blood cells than the flat-landers. I did not notice ground speed at landing, as I was focused on airspeed. Takeoff took about 1/3rd of the runway, or a bit less, but I used the brakes to hold during initial engine run-up, and as soon as my airspeed hit lift-off, I picked the plane up off the runway, but kept the nose down to build up airspeed without drag. By the end of the runway I was doing 75-80 kts, and climb wasn't an issue. The only thing I would do different in retrospect, would be to use a straight in approach (which I dislike) rather than a standard pattern approach.... so depending on traffic, I recommend a straight-in. Maneuvering at high altitude is a bit trickier than I would have liked. Completed a trip today from Longmont, Colorado to Leadville, Colorado. The airfield in Leadville (KLXV) is at 9,934 ft. Density Altitude landing was at 10,600. Density altitude at take-off was 11,000 dead-on. Total trip was 3.5 hours and most of it was at high altitude. My homebase of Longmont (KLMO) is at 5,400. 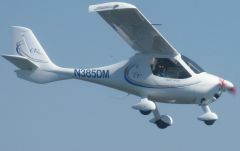 I fly a CT2k, 100 HP 912 ULS, and it handled the high DA without trouble, but then again I didn't do any extraordinary maneuvering and my wings have a 3 ft wider wing-span than all subsequent CT models. Also, my empty weight is 717. Today, two people, baggage, and 24 gallons of fuel probably put me near 1,275 pounds at take-off from Leadville. 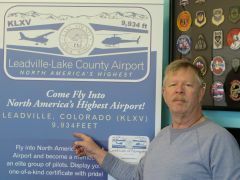 Earlier this year, I flew from Longmont to Puget Sound and back. Superb trip and great weather. The trip to Leadville was on my bucket list. Death Valley will be coming up within the next 12 months..... at least that's the plan.